Really, really look at it. Look at her eyes for more than just a few seconds. I cannot get this image from a few days ago out of my head. She is standing on Independence Square in Kiev, Ukraine, hoping that the government of her nation will turn towards Europe and will not step back towards Russia. She is hoping. Look at her eyes and think about what it would be like to be her age in a country that has been oppressed again and again. Look at her eyes and think about the fact that her parents or grandparents or someone she loved was shipped off to the gulag or was starved to death in a famine that killed 33,000,000 people and was orchestrated by the government. I know that we all have different things that have come into our lives and grab our hearts and make us uncomfortable and cause us to feel like we need to do something. I also know that something that grabs my heart may not grab your heart. I know that. Ukraine grabs my heart. When I first ventured outside of U.S. borders in October of 1992, and ended up in Ukraine, I was a rookie traveler. I was a rookie traveler who grew up in a comfortable family, and who always had pretty much what I needed. I left the country 21 days later, crumpled up on the seat of my bus, unable to stem the flow of tears from my American eyes. My heart was forever changed that day. The late October afternoon I left Kiev, just steps away from where the babushka in the picture is standing, Alexander, my interpreter, from across the room, mouthed three words that have haunted me to this day..."Never forget Ukraine." I've been back twelve or fifteen or eighteen times. I don't know. I've lost count. It doesn't even matter. What matters is that I never forget Ukraine. I can't forget the Roma children who experience intense racism that robs them of education and opportunity for a better life. 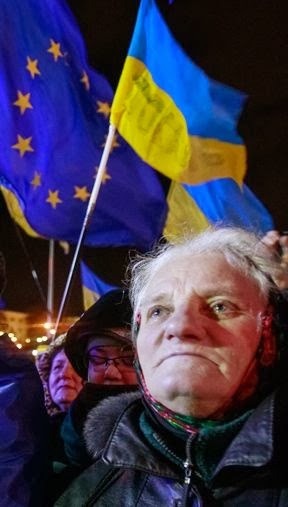 I can't forget the babushkas like the one in the picture above, who, in the last two weeks, have again dared to hope that things might change for the good in the land that they love. I can't forget the sadness that has overshadowed this land...sadness borne of evil men who have caused grief after grief after grief that has slapped and beaten and knocked these people down. I can't forget the depth of the warm hospitality of people who would give you their last loaf of brown bread or that one precious vase that belonged to their great grandmother once they realize you are for real and your care for them is simply that...care for them. I can't forget the children in the state-run orphanage system that don't get the care and the education that they so desperately need. The problem usually isn't the workers. The workers often love these children and are dedicated enough to stick around for years for a few dollars a month. They simply don't have the resources to provide what is needed in a country that is an economic wreck as a result of years of oppression and plundering by those same evil men I mentioned earlier. I can't forget that my burden is not your burden. I will keep going to Ukraine. On that fateful day in early October of 1992, my wife was standing at the window of the Eugene Airport with our three boys at her feet and their noses smashed up against the window, waving as the plane taxied down the runway, our six month old daughter in her arms. At that moment, I felt the Father nudge my heart and whisper that what was happening was far bigger than I realized. Now, twenty years later, that six month old is in Ukraine working with those Roma children and those orphans. She returns in a few days. Now, twenty years later, my niece and her husband and children have moved to Ukraine to work with more of those orphaned children, the lost of the lost, who have been hidden away due to disability. Yes, the continuing story is far bigger than I realized. As important as all of this is to me, the point of this missive is not that you feel bad or take up my burden, though of course I want Ukraine to be important to you, too. If you've read this far, I want you to refer back to the title...Did you notice? Did you notice? Now, look at the photograph below. 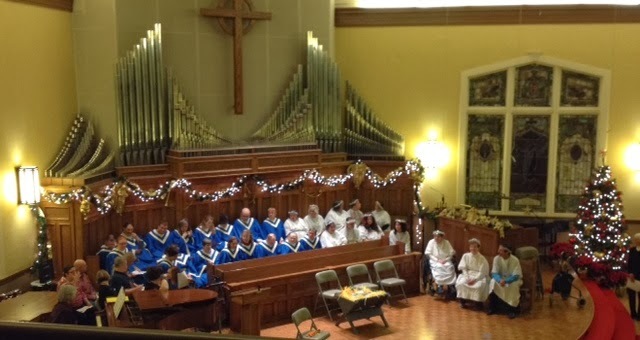 This is a photo I took at the beginning of the Christmas pageant at 7:30 p.m., last Wednesday night, at First Presbyterian Church. It's a long-standing tradition, put on by loving volunteers, who facilitate and coordinate and hold the hands and guide the feet of the disabled adults who present this gift to the community every year. If you've never experienced this event, don't miss it next year. Now...what does the presence of several hundred thousand people in Independence Square in Kiev, Ukraine, have to do with a small group of disabled adults in Corvallis, Oregon? Actually, the clue is in my question...Did you notice? Did you notice these events? Did you notice these people? Did you take a minute to see, to really see what is happening around you? Some events are earth-shaking and are significant. Some events seem insignificant, but are not. Notice them. I'm challenging you to notice. I'll leave it at that.